Few know the true history of Celik, those who have heard of it at all usually consider it a ruin of a forgotten age. If it were not for House Maraneth the once vibrant city may have been completely enveloped by the Silt Sea. After the destruction of Kalidnay over a thousand years ago the wealthy merchant house had no base of operations. In order to remedy this problem it set out with what resources it scavenged from the ravaged city-state and attempted to put roots down in other cities like Tyr, Altaruk, or Balic. However; the entrenched merchant lords of those cities did not allow the refugee house to take hold. Fighting the battles in the cities hurt the struggling house even more and they had few caravans and even fewer prospects. Hundreds of years went by as House Maraneth was relegated to the ranks of a lesser nomadic trading house. Luckily for House Maraneth they had a promising agent, Turell Asai, in their employ who found an ancient cache of goods in the forgotten ruins of Celik. The agent imagined that there was much to be gained in the silt drowned city for it seemed that the silt was pulling back, revealing more and more of the city for exploration. Having little choice House Maraneth put its faith and dwindling resources into the hands of this agent to mine the ruins from the Green Age. House Maraneth wasn't the only player in this game, for the outskirts of the ruin have long been a trading crossroads for those tribes south of the Tablelands for years. House Maraneth had to cunningly placate the local tribes or overcome those they could not reason with. In the end their risk was rewarded as House Maraneth made a living, plundering the remains of the city. Additionally, they made a stronghold for themselves outside the purview of the sorcerer-kings or the adversarial Merchant Dynasties. Even though it could be said that the Merchant House has prospered because of Celik, the region is dangerous; it is Athas after all. For as long as the ruins have been claimed by the Merchant House, there have been struggles with neighboring tribes within the ruins and without. For every two crumbling building the Maraneth mercenaries uncover another rots away or is taken over by the horrible denizens of the ruins. These strange manifestations are brought about as a result of the psionic calamity that befell Celik during the Green Age. During the height of psionic advancement and experimentation, the nobles of Celik attempted to bridge the space between two faraway cities. The name of the other city was lost to time and the inhabitants of Celik were ripped away from Athas never to be seen again. Thorough exploration of the ruins could reveal this historical fact and may expose a way to calm the psionic anomalies. In addition strange creatures from other planes have found their way to Celik somewhat recently, making dens in what is known as the Raving Vicinages, drawn by the same psionic resonance that draws the beasts of the wastes. House Maraneth has yet to realize the threat these beings represent and it may be too late to deal with them. When the psionic event happened that rid Celik of its living citizens, a rift to the Grey opened, and the spirits of those who previously died in Celik, or who's bodies remained there, returned and were bound back into their ancient remains. These newly created undead, both intelligent and beastly, have carved their own niche in the Celik environs. The restless dead can not travel too far outside of the city as some unknown force draws them back to their former resting place. Even if they are destroyed their body and spirit reform to haunt the mortal residents of Celik before too long. Most of the inhabitants do not recognize this fact and only see hordes of undead pour forth from the Lych Gate and out of the Roads Below. The most powerful of the undead is a Meorty, a Green Age guardian of the city's class structure. Those who follow the Meorty's forgotten laws may travel the city unharmed, but those who break the law, knowingly or not, will suffer the wrath of the mummified sentinel. The Living City, Celik's civilized area, is ruled by Patriarch Korsun Maraneth. The trade lord is little better than a petty despot, using his House and caravan guards to maintain order. Additionally, mercenaries are hired to protect the walls of the Living City from the denizens of the unrecovered ruins. Any would be treasure hunters would do well to buy a license from Korsun to delve into the ruins. Failure to buy a license can result in indentured servitude as well as a 100% tax on the items recovered. If a treasure hunter can't afford the license a short period of indentured servitude will suffice. Korsun Maraneth is not who he claims to be. He is an imposter who is responsible for House Maraneth's survival as well as its obscurity over the centuries. When the Maraneth agent, Turell Asai, found the ruins of Celik so long ago he also found some Green Age relics, one of which was a finely crafted necklace. The necklace held the psychic remains of a Celikite who was present for the psychic phenomena that rent the city so long ago. This disembodied ego has continually taken over the personality of the ruling Maraneth and continued its search of the ruins for a way to bring back those who were lost thousands of years ago. An ancient psionic terror rests in a dreamlike torpor beneath the city of Celik. Thousands of years ago the Villichi, a highly psionic offshoot of humans, failed to recognize one of their own in a child from Celik. The Villichi child, Karala, was shielded with The Way by her captors and kept as a slave by an ancient order of psion-monks. When the city was psionically sundered, the Villichi slave escaped, shielded by the psychic static. She has roamed the ruins of Celik for thousands of years by psychically feeding on those who happen to pass through the ruins. The Villichi from the nearby convent have, over the years, attempted to reign in their deranged, seemingly immortal sister to no avail. For reasons unknown, Karala will occasionally go into a psychic torpor lasting tens, hundreds or thousands of years only to awaken unannounced to wreak havoc on the residents of Celik. Recent events are soon to awaken Karala. Tamwar elemental sovereign of the Crystal Dunes has risen and gathers the disparate tribes of her people for a holy crusade to the northern city-states. Given sanction by the elemental priests of her tribes, Whel-a-kai has united several tribes under her kite. She aids all in her path and her horde grows with every successful raid. The people of the Crystal Dunes are a fractious lot and Whel-a-kai has many hurdles to over come before many tribes will put their face to the sand for her. Prophecy is never clear and the different opinions of the sacred orders stifle Whel-a-kai's ambitions. To create a horde large enough to conquer the northlands and draw all within sight to her kite, Whel-a-kai must destroy the sacred orders of his people. The nikaal bands of the Pitted Rock grow uncharacteristically aggressive as of late. A demon imprisoned in the nikaal's holy stone has taken over one of the reptile men, Tsaerres , and persuades the nikaal to war with all who oppose him. The demon from beyond Athas hopes that Tsaerres will be able to free him from his ancient prison in the Pitted Rock by bathing the rock in the blood of his enemies. The nikaal are not a warlike people in general and finding allies has ben difficult. The gith of the region are cowardly and depraved, the Tamwar to the east have always been an enemy of the nikaal, to the west are a few undependable elf tribes and in the north are the flighty kenku of the Feathered Crags, which have been agreeable to fighting with the nikaal for a price. 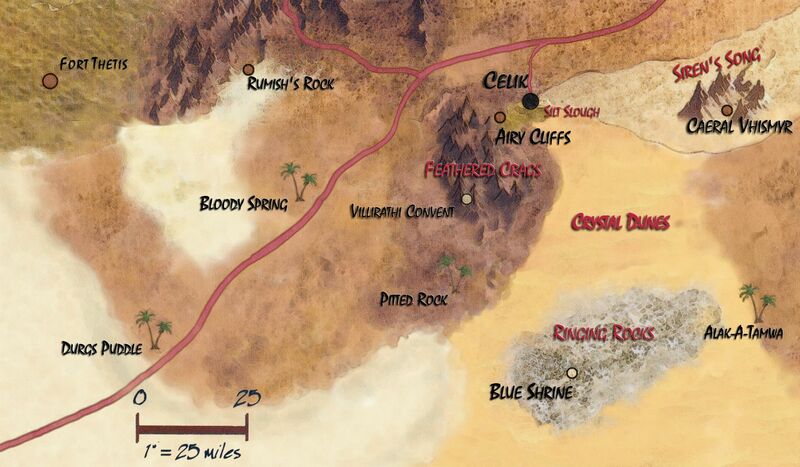 The kenku are better used as scouts than warriors so Tsaerres has sought out the reclusive Salt Riders of the Alkalai Bed, the salty wasteland to the southwest of the Pitted Rock.